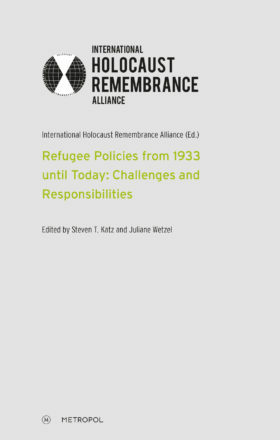 The fourth volume in the International Holocaust Remembrance Alliance publication series presents the outcome of a conference, held in February 2017 organized in cooperation with the Holy See in Rome, on refugee policy from the 1930s to the present day. Pope Francis has referred to the plight of refugees today as “the greatest humanitarian crisis since the Second World War.” At a time when the current situation of refugees in Europe and the Middle East continues to dominate the news and the political arena, this volume brings together experts in Holocaust history, representatives of the Holy See and experts dealing with issues of law and human rights to reflect on the past with a view to constructively informing positive, ethically responsible and rational policymaking today. Looking to the past, we are reminded of what happens when xenophobia, racial hatred and antisemitism go unchecked in society, and when governments succumb to right-wing nationalist political movements. The message here is clear: hate and prejudice undermine the democratic political order and they are abetted by indifference. This was true in the 1930s and 1940s and it is just as true today.